Bear with me here. This sounds like an experiment with no real-life value or application. But like the makers of ‘Lost’, I have a plan. Well, unlike them, I actually do. It’ll become clear over the next months. My gut reaction is: sure we can! But I want to know, and for that, I need to do it. Whilst I am doing it, why not document it as well? I am a blogger, after all, am I not? The library handles all of the requirements above beautifully, except the processing and displaying of the results, of course. Check out the example code that comes with the library, it is ridiculously easy to use. The next step is to use it for something slightly more complex than reading all report suites. We want to be able to add parameters to the call and get some actual data back! 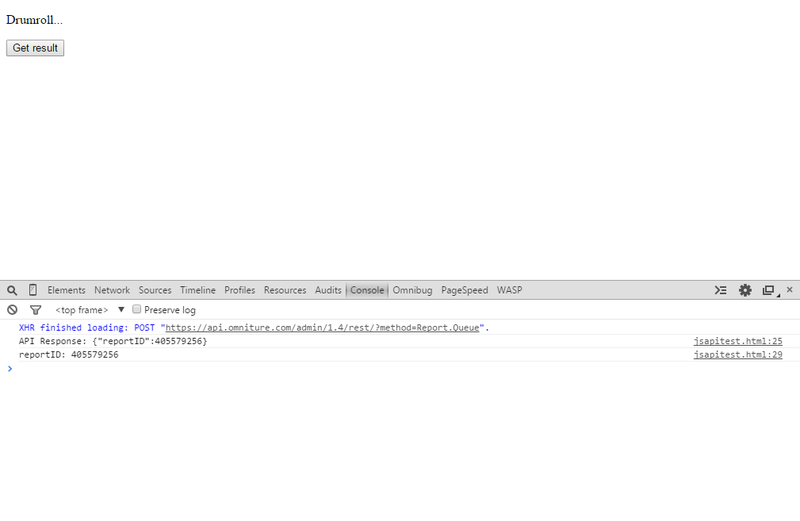 The Analytics documentation on the Developer Connection is a good place to start, but I know an even better place: the API Explorer! I can select an “API” and then a “method”. The UI will reflect that choice and tell me what the “method” variable in my code has to be. 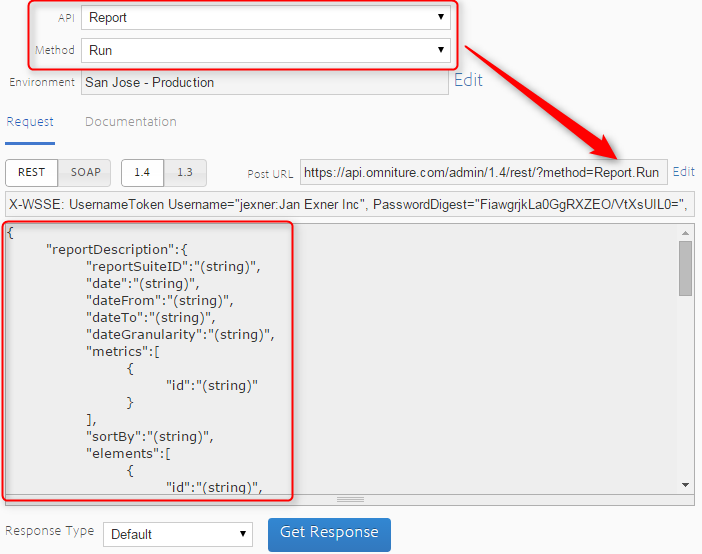 Example: I select “Report” as the API and “Run” as the method. My variable has to be “Report.Run”. 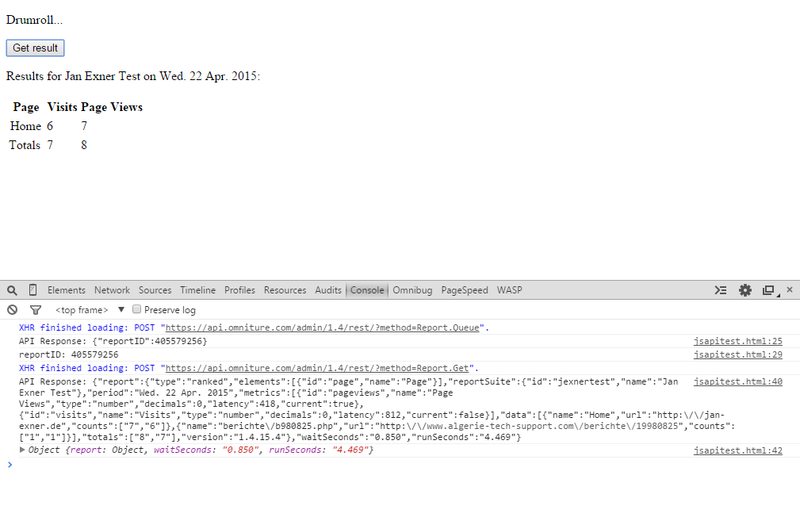 Yes, yes, you don’t need an API Explorer to tell you that there’ll be a “.” between those two, I know, I know. 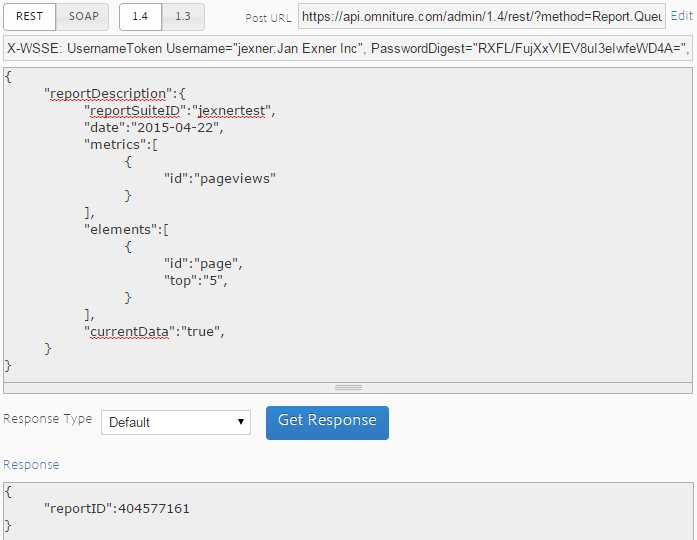 But the API Explorer will also generate a list of all possible parameters, and that means you don’t have to look at the documentation. Let me show you a complete example here. My page is simple enough to be understandable, I hope. When I load it, it queues a report. If the queueing is successful, it enables the “Get Result” button, which in turn, when clicked, retrieves the data and inserts it into a formerly emtpy <div>. Want me to walk you through that? Sure. Lines 7 — 14 take care of setup. I’m loading jquery and the two libraries I got from github. Then I set variables for credentials and endpoints because we need those in every call to the library. 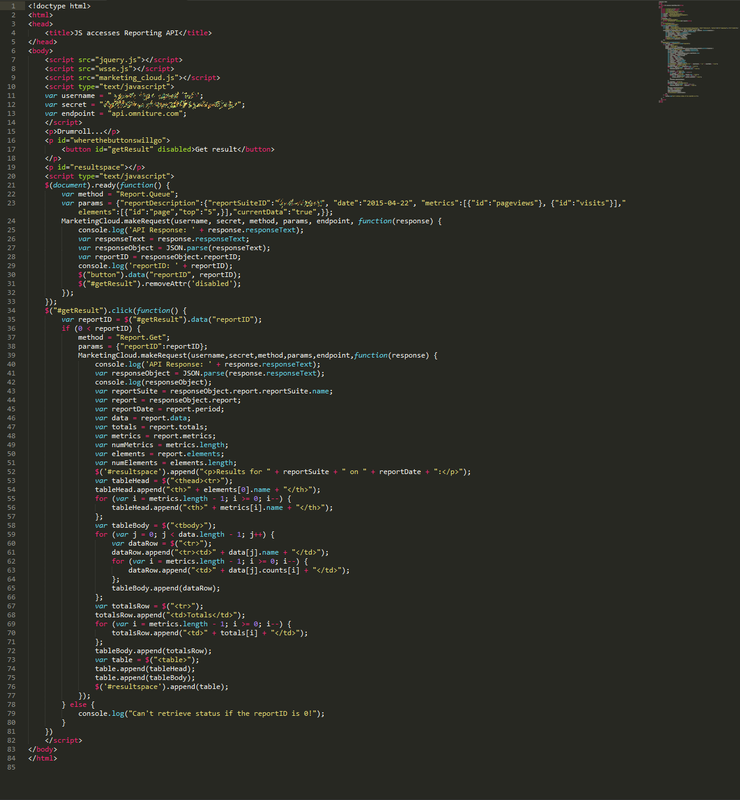 Lines 15 — 19 are the HTML scaffold for the page. Yes, that is pretty lean. The script on lines 22 — 32 is executed when the page has loaded. On line 22 I set the method I want to call and on line 23 I define the parameters. Line 24 contains the actual call. Lines 25 — 31 define a call back function that the library executes when the API has replied. It spits out some debug information, extracts the report ID (line 28), attaches it to the button as a data ttribute (line 30), and enables the button (line 31). All of this happens when you load the page, without any further interaction. But now the button is enabled and you can press it! So on lines 34 — 81, I attach a click handler to the button. 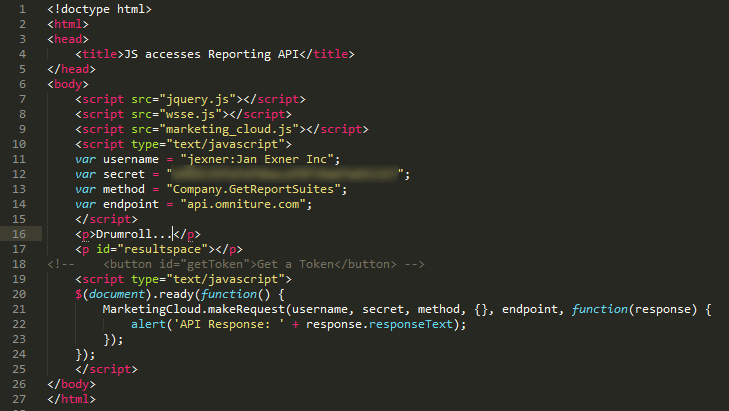 Same structure here: a click on the button triggers a call to the API via the library (lines 35 — 39) plus a callback function that handles the result. Lines 53 — 57 deal with the table header, looping over the metrics and getting their names (lines 55 — 57). Similarly, I am looping over the data set (lines 59 — 66) to get all numbers for each metric. To put some icing on the cake, I do a final loop over the totals (lines 69 — 71), then add everything to a <table> element which I add to the page. Your next steps should be to use some charting library (like D3 or whichever works for you) and make the data look good. You would also likely not use a button and user interaction for retrieving data but rather use a timer and repeat. Keep the data updated. The result can be a very pretty and compelling visualisation on a big screen somewhere in your office. The more people look at it and discuss it the better! I personally run them locally, on my laptop. But I am a consultant, and that means I need flexibility rather than stability. From the projects that I have seen, I’d say a lot of people run it on some dedicated machine, not necessarily a server. HI Jan, This is a really great article, although I have not been able to replicate it. I have used your code lie for line. If I use API1 as an endpoint it stays pending for a minute, and then fails. If I use API3 i get a 404. Any ideas? HI Jan, This is a really great article, although I have not been able to replicate it. I have used your code line for line. I need to edit the article or write a new one, I’m afraid. API 1 doesn’t work anymore, and API 3 is a bit different. Will do soon. Can you try using that code as a basis? 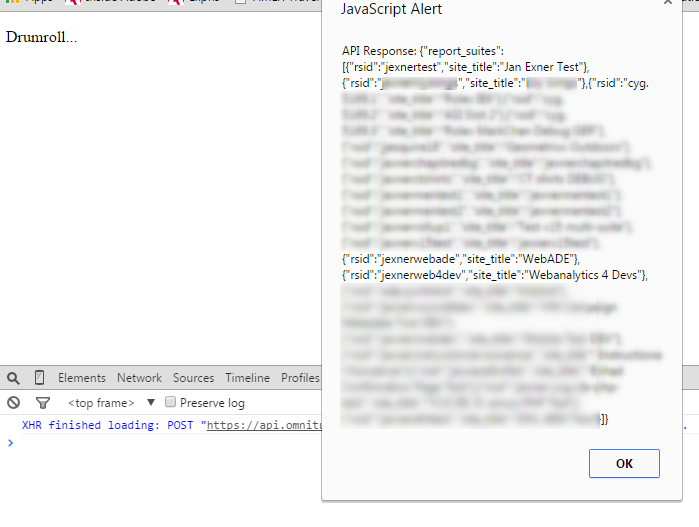 I dont have jquery library and i am using your logic in Adobe Campaign application. What exactly is it you are struggling with?